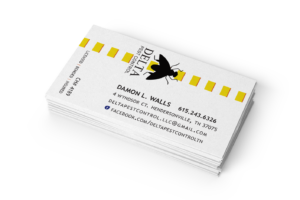 Delta Pest Control, located in Hendersonville, TN, wanted to promote their business by keeping their name prominent in front of their customer. Upon discussion, it was decided this goal could be accomplished by giving away a refrigerator magnet, business card size, with their contact information. Delta had a great design on their existing business card so the team at Silver Cricket Designs recreated the information and logo to match the printer’s specifications. Once the design was approved, Rhonda, the lead designer, worked with the printer to produce the refrigerator magnet and have it delivered to Delta.